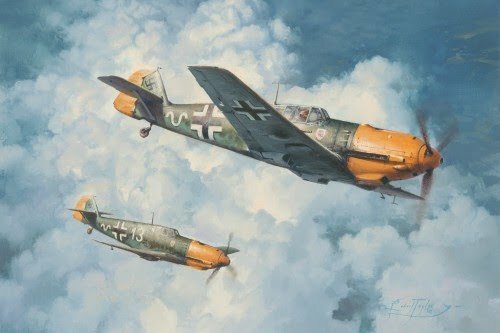 You can feel the tension in this evocative painting as Messerschmitt Bf109s from 7./JG2 Richthofen head out on a long-range fighter patrol in September 1940. With the sun behind them they hope to launch a surprise attack on unsuspecting RAF aircraft, however these enemy raiders will soon be intercepted by some of Fighter Command’s most determined ‘defenders of the realm’. Major ERICH RUDORFFER Knight's Cross with Oak Leaves & Swords Flew Bf109s with JG2 becoming a double Ace during the Battle of Britain and finished the war with 222 victories to become the seventh highest-scoring Ace in history. Generalleutnant GÜNTHER RALL Knight's Cross with Oak Leaves & Swords Flew Bf109s with III./JG52 during the Battle of Britain. By the end of the war he scored 275 victories making him the third highest-scoring Ace of all time. Knight's Cross Flew Bf109s with III./JG54 becoming one of the top Aces of the Battle of Britain with 14 victories. He finished the war with 60 victories.